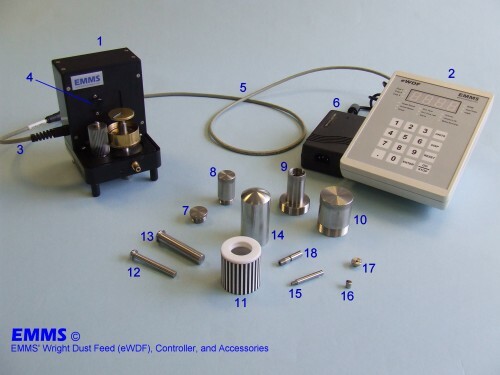 EMMS' Wright Dust-Feed (eWDF) provides a very stable and precisely controlled delivery of dry powder. The eWDF is based on the design of B.M. Wright, M.A, M.B. of the Medical Research Council, UK: circa 1949. A range of different dust cup sizes are provided, for administering different volumes of material. An electronic controller provides very precise control of the cutting and dust generation speeds, and includes a novel stall sensor\alarm to alert the user to a cup rotation stall condition. Please contact EMMS for more information.